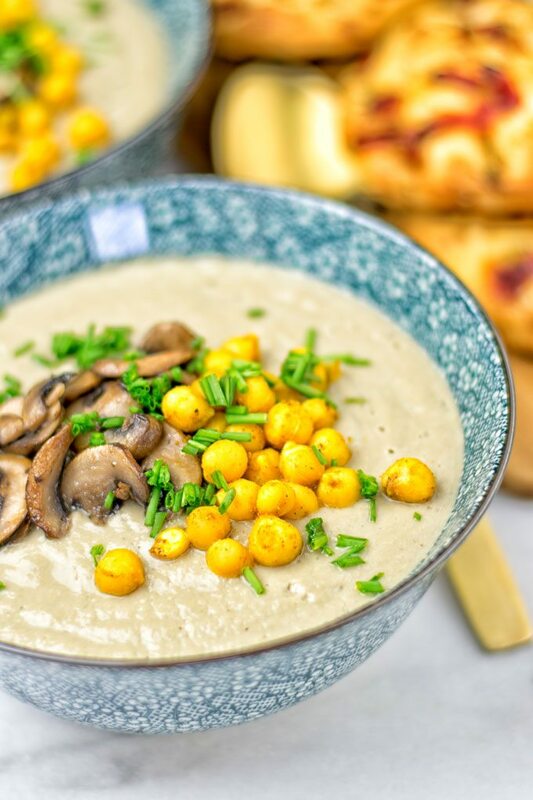 This Roasted Chickpeas Cream of Mushroom Soup is creamy, entirely vegan and gluten free. Fresh mushrooms join flavor with onions and garlic, and are served with crunchy Tandoori spiced chickpeas. There is something magical about that time when we all get excited of big bowls of soups like this Vegan Sweet Potato Soup with Kale, the Leek and Potato Soup, or the Moroccan Chickpea Lentil Soup (Harira). It’s just the image when you think about cozy nights, munching on a big warm soup. Relaxed evenings with your loved ones, friends and family. Being together with the people you love in good company and with good food is always the best thing to happen. Believe me you will having a hard time just waiting for the roasted chickpeas. They are so comforting with lots of flavors from warming spices. There are a lot of mushroom soups out there. That is no secret. Of course, I don’t reinvent the wheel. 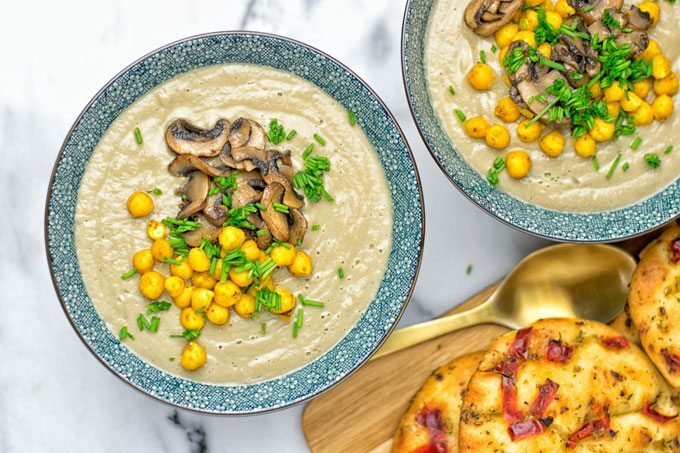 But trust me when I tell you this is the best cream of mushroom soup that you will ever make and eat. You only need this recipe, no others. 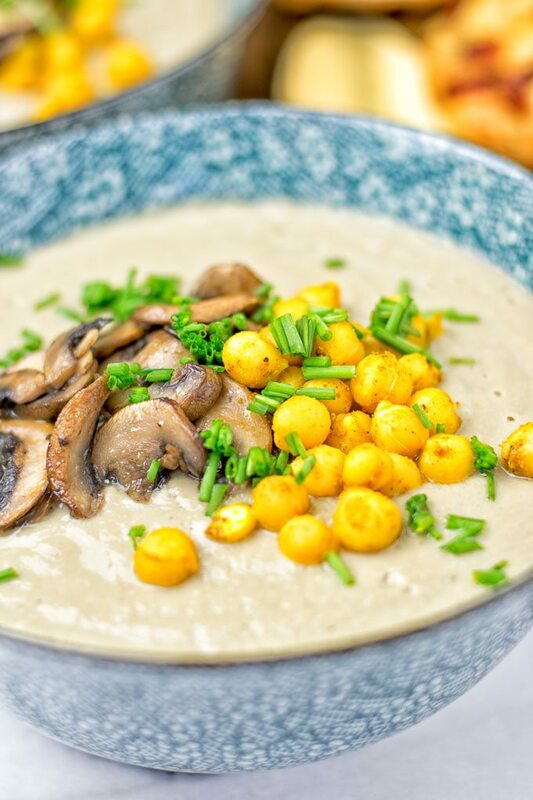 I tested this Roasted Chickpeas Cream of Mushroom Soup a lot. What I came up with is so timeless, yet classy but with a modern touch. Just the soup itself is impossible to resist. It’s all about comfort and this will make you really excited to have this on your plate. What could be better? 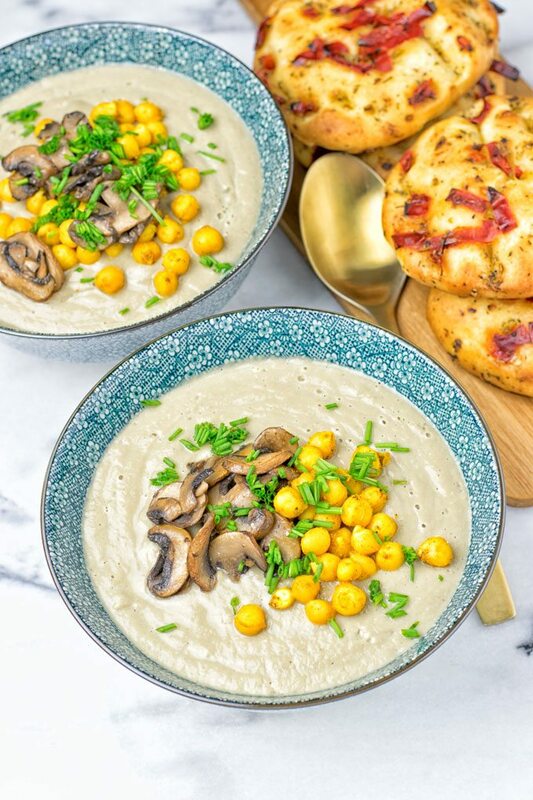 You know I surely step up the game when I show you I topped this soup sensation with roasted chickpeas infused with incredible flavors. Deal? I hope you come on board and you mouth is already watering. 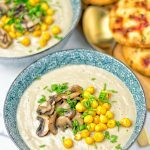 This Roasted Chickpeas Cream of Mushroom Soup is super creamy, easy to make, the perfect warming pick me up. 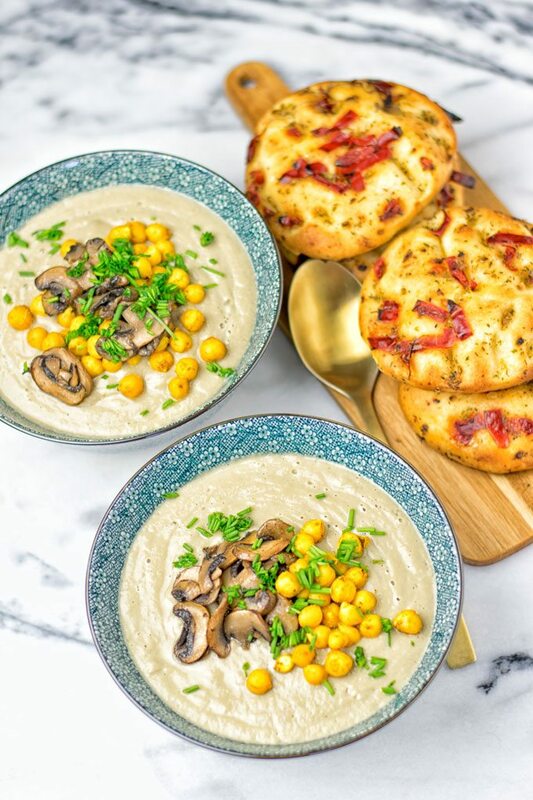 Full of fantastic flavors, addictive, just one slurp will make you crave more, shareable, made for relaxed weeknight dinners, hearty, cozy and seriously the most delicious soup you’ve ever eaten. First mix chickpeas and spice mix in a bowl until they are well covered. Put these on a baking sheet prepared with parchment paper. Bake for around 15 minutes at 410°F. While the chickpeas are roasting, let’s make some soup. Heat a touch of oil (or vegetable broth for oil free cooking) in a casserole. Fry garlic and onions for 5 minutes. Then add the mushrooms and all the other ingredients, and fry for another 5 minutes. Reserve 1/4 of the mushrooms, transfer the rest to a blender. Blend until smooth. Next and last: put the soup back into that pot and reheat. Add reserved mushrooms to that pot, cook for 3 minutes longer. Divide into bowls, top finally with roasted chickpeas. Enjoy. Note: I use vegetable bouillon but you can use broth of course. Just make sure it’s only the powder, without adding any liquid. You might find it a bit surprising that we only need a small amount of coconut milk for that soup. It’s because mushrooms contain a lot of natural liquid, so there is no need for extras. Trust me I tested that recipe a lot and I find it is just the right amount for the consistency. This makes an insanely delicious diary free alternative which is awesome for lunch, dinner or even snack time. It will surely impress all guests if you serve this on a potluck or get togethers. I would say it’s a big winner for date night as well. I mean this soup is made with super easy ingredients, that you might already have in your pantry. But simply doesn’t mean boring or not exciting. This soup will leave everyone wanting for more. Because it’s just the flavor signature which is so impressive. Such a dazzling soup for sure, and so easy to make with such approachable ingredients that are available all year long. Soups give us always the feeling of being home. There is something about them. It doesn’t only taste deliciously and is filling, we also get the special feeling that makes coming back for more. 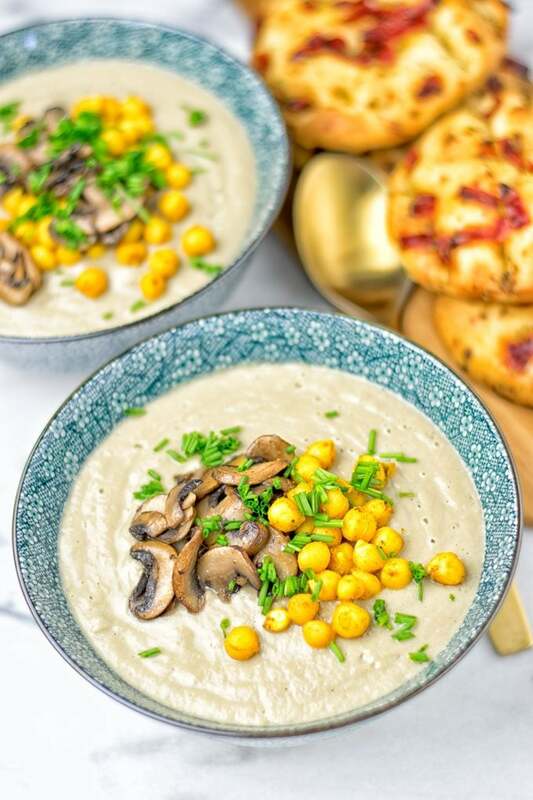 In this Roasted Chickpeas Cream of Mushroom Soup you get a lot of benefits from the mushrooms. They are high in selenium, vitamin A, and iron. For real a immune booster, full of antioxidants that will take care against free radicals during oxidation. Another stellar component is coconut milk. Rich in fiber, vitamin C, E, B1, B3, B5 and B6. Also high in minerals like iron, selenium, sodium, calcium, magnesium and phosphorus. If you give this a try, tag me on Facebook and Instagram. I love seeing all your remakes. Cheers and enjoy a big bowl, Florian. While the chickpeas are roasting, let’s make some soup. Heat a touch of oil (or vegetable broth for oil free cooking) in a casserole. Fry garlic and onions for 5 minutes. Then add the mushrooms and all the other ingredients, and fry for another 5 minutes. Reserve 1/4 of the mushrooms, transfer the rest to a blender. Blend until smooth. Next and last: put the soup back into that pot and reheat. Add reserved mushrooms to that pot, cook for 3 minutes longer. Divide into bowls, top finally with roasted chickpeas. Enjoy.